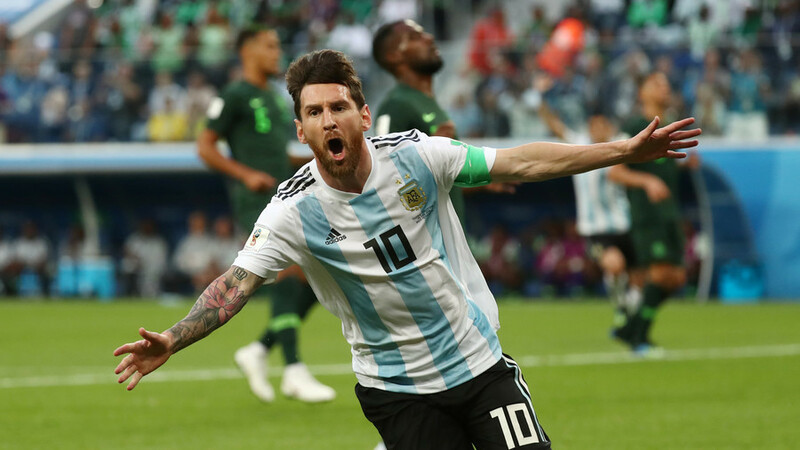 Lionel Messi and Marcos Rojo gave Argentina the chance of a fresh World Cup start with a goal each to ensure a 2-1 win over Nigeria which saw La Albiceleste advance to the final 16 after an abject start to Russia 2018. After recording a draw and a loss against Iceland and Croatia respectively in their first two group games, Argentina were left needing a win against Nigeria in St. Petersburg to ensure qualification to the knockout stage. And they did just that courtesy of a first World Cup 2018 goal for captain Messi and a late winner from defender Marcos Rojo. But the South Americans did not have things all their own way. Messi deftly took down a beautiful through ball from Ever Banega from near the halfway line on his left thigh before taking a touch and then firing right-footed past Super Eagles keeper Francis Uzoho to make it 1-0 after 14 minutes. The goal made Messi the first and only player to score a World Cup goal as a teenager, in his twenties and in his thirties. The Barcelona star had earlier gone close but missed his penalty against Iceland in the group opener. Argentina went into the break in front, but soon after the restart found themselves in hot water when Mascherano was penalised for wrapping his hands around Leon Balogun in the area while defending a corner. The Nigeria midfielder collapsed into a heap, and Turkish referee Cuneyt Cakir consulted VAR before awarding the spot kick, which appeared to be the right decision. When the dust settled, Victor Moses, perhaps the coolest man in the stadium, coolly slotted the spot kick home to equalize on the night, and put Argentina’s hopes of salvaging qualification from an abject start in serious jeopardy. Moments later and Balogun was yellow carded for cynically bringing down Angel Di Maria just outside the box. Messi stepped up to take the free kick just outside the area and agonizingly hit the post low to Uzoho’s left hand side. VAR took center stage once again when Odion Ighalo dragged his shot wide after Rojo attempted to head the ball clear. The Nigeria players were adamant the ball hit the defender's left arm, but this time Cakir returned from the VAR screen sure there was no penalty to give. When Gonzalo Higuain fired high and wide as the match approached 80 minutes, you’d be forgiven for getting the feeling it wasn’t going to be neither Argentina’s night nor their tournament. Ighalo could have put the game beyond any doubt when he went through on goal but his low shot from a tight angle was well saved by Franco Armani. Another penalty claim was dismissed, this time at the other end and without the help of VAR, when Sergio Aguero hit the deck under a challenge while through on goal, but Cakir waved away the protests. As time ticked away, Gabriel Mercado hopefully crossed the ball into the area, where Rojo slotted a cool side-foot finish into the left-hand corner of the goal from around 15 yards out, to send Argentina's fans into raptures. That goal saw Argentina steal into second place and win qualification from the group, shaking off the pockets of negativity that had gathered during their short World Cup campaign. Messi, Rojo and co. had ensured that no one would be crying for Argentina - at least for now.